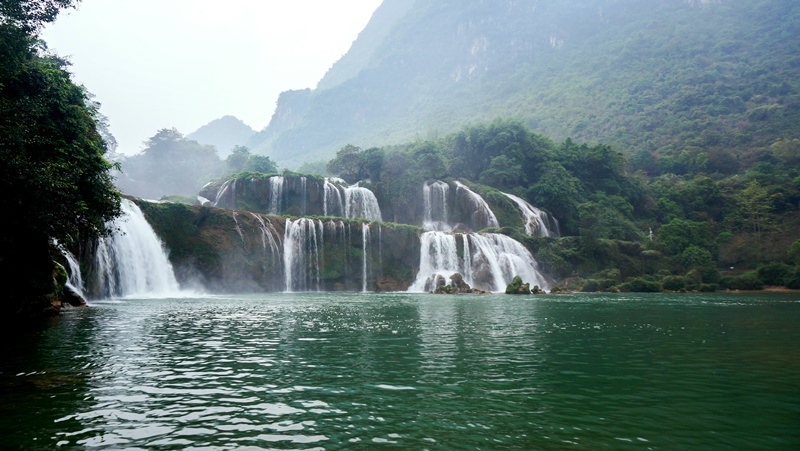 The Ban Gioc waterfall on Quay Son River in the northeastern province of Cao Bang province is one of Vietnam’s best-known waterfalls for its grandeur and charm. 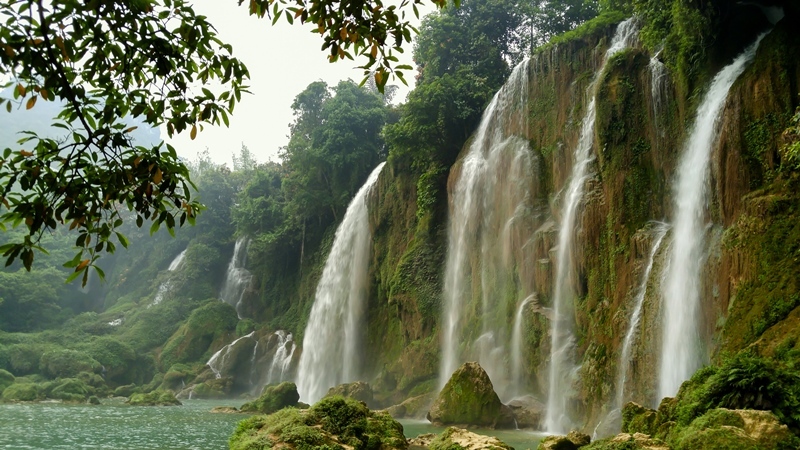 Ban Gioc Waterfall is designated as a national scenic spot pursuant to Decision No. 989/QD-BVHTTDL of May 20th 1998 of the Ministry of Culture, Sports and Tourism (MOCST). Located in Dam Thuy Commune, Trung Khanh District, it is regarded as the fourth world largest waterfall at an international border, after Iguazu Falls between Brazil and Argentina, Victoria Falls between Zambia and Zimbabwe and Niagara Falls between the United States of America and Canada. Located on the Quay Son River Ban Gioc Waterfall is approximately 300m wide and about 35m high, with three cascades at 14-15m, 10-12m and 6-8m high respectively. 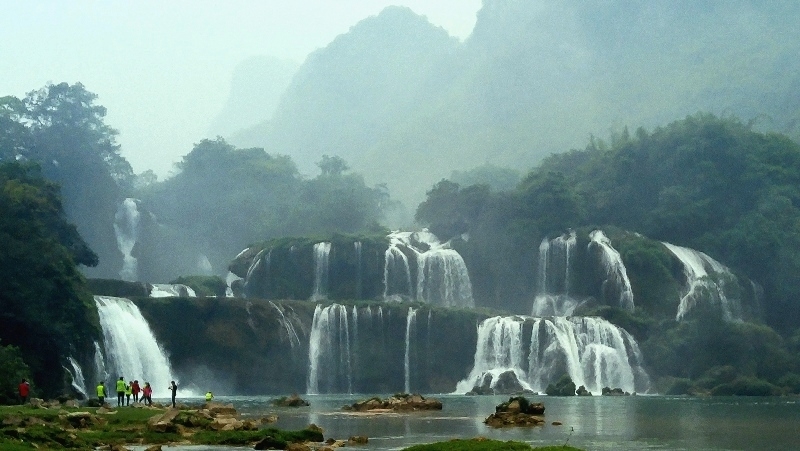 Surrounding the waterfall is a mature to old karst landscape with peak clusters-depressions transited to isolated towers on a planation surface at an altitude of 400-600m with a thick vegetation cover. 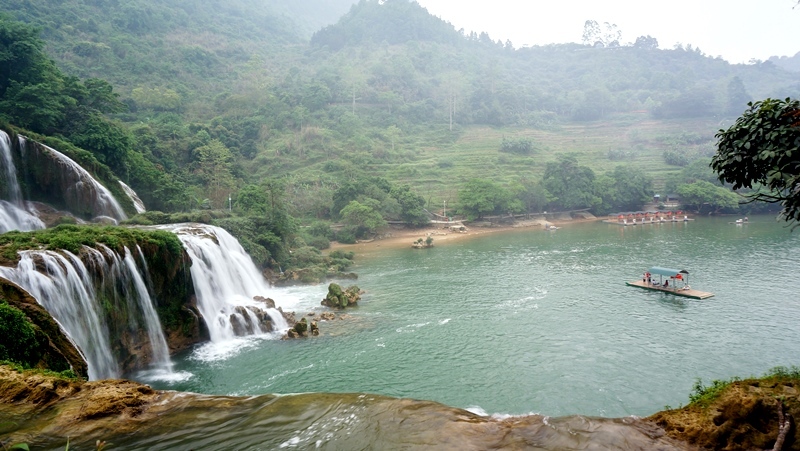 A NE-SW fault cuts through limestone and shale of the Ban Cong Formation (D2gvbcg), resulting in the waterfall. 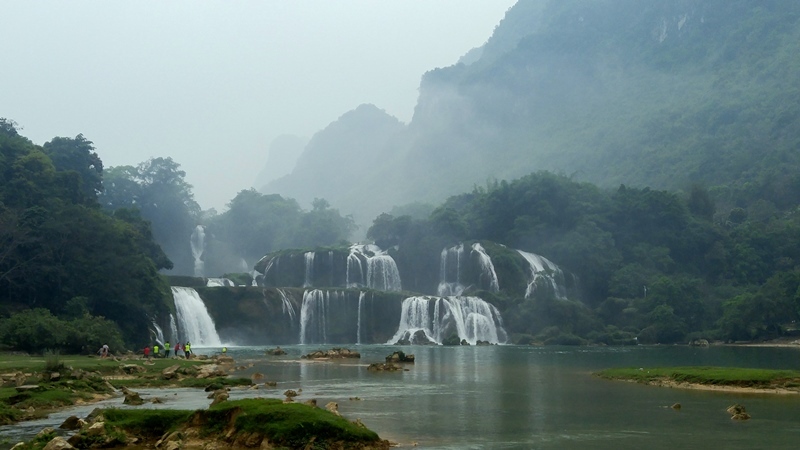 Most of the 600,000 tourists coming to Cao Bang Province visit Ban Gioc Waterfall and there are even more from the Chinese side. In addition to its aesthetic value, the site also offers educational and scientific information e.g. various karst landforms, faulting, fossils, rock types etc. A so-called “Truc Lam Ban Gioc” Pagoda has recently been erected beside the Waterfall which increases the spiritual sense of the site. The Province is cooperating with SaigonTourist Co.Ltd. to improve the tourist infrastructure at this internationally significant geosite. Stretching the international border between Vietnam and China, it has been a natural demarcation between the two for long. The waterfall is also listed among the largest along a national border. 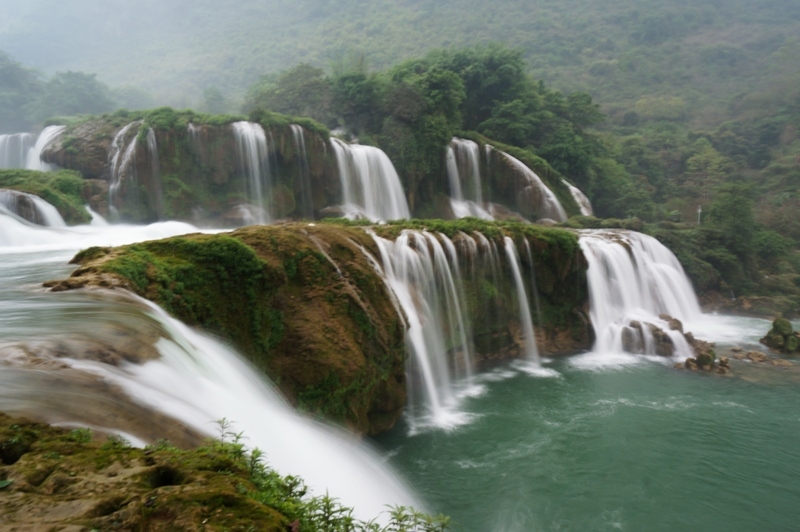 Located in Dam Thuy commune, Trung Khanh district, the waterfall is fed by Quay Son River rising from China. The river flows into Vietnam and reaches Dam Thuy commune at Ban Gioc village. 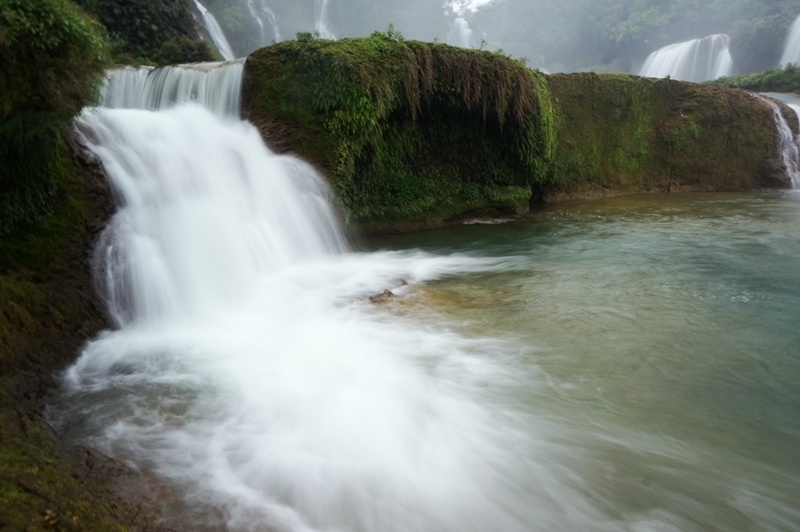 Here, the flow divides into several branches and lowers its flow to create Ban Gioc waterfall. The waterfall measures 35 metres high and spans 300m. Great water columns can be seen from a distance. The waterfall is separated into three layer-falls by rocks and trees. Large volumes of water pouring down to lime stone steps form a curtain of white spray. The ‘roar’ of the waterfall can be heard kilometres away. The beautiful enchanted jade-blue water at the foot of the waterfall, surrounded by green from the northeastern jungles. Visitors could take bamboo rafts to approach the cascade for better views. The water flows also create smaller falls to the left of the central waterfall.